This was a 14 day cruise from New York to the Caribbean. It was originally scheduled as a 12 day cruise but a change in U.S. law required Norwegian Cruise Line to cancel the two day cruise-to-nowhere that had followed this cruise in the schedule and so those two days were added to this voyage. The ship called at St. Thomas, St. Maarten, Tortola, Dominica, Barbados, Martinique and Antigua. 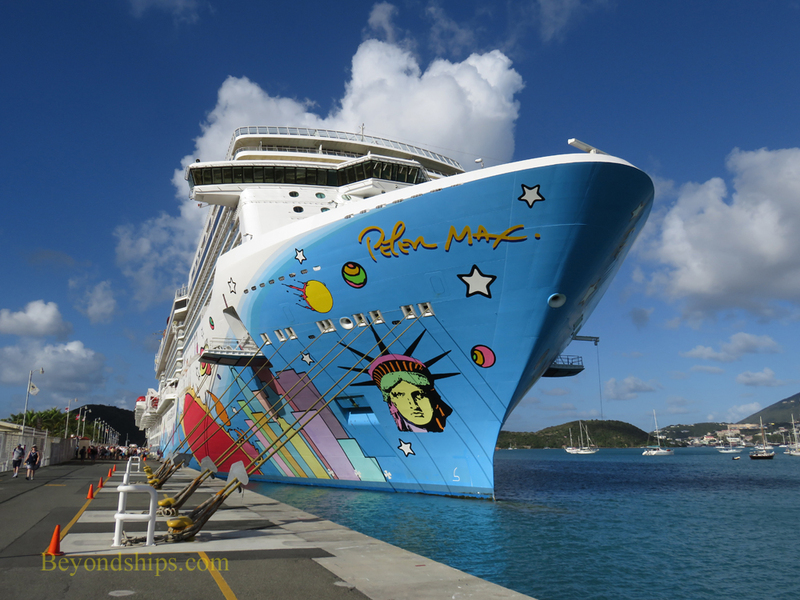 Just under three years old, Norwegian Breakaway remains a first tier, state-of-the art cruise ship. On this cruise, she scored well on dining, entertainment and on her nautical qualities. Inasmuch as Breakaway is based in New York City, it is not surprising that the majority of the guests were from the northeastern United States. However, there were also significant numbers of French Canadians and Germans as well as some guests from the United Kingdom. Since this was a long cruise while school was in session, there were few children aboard. Most of the guests were in the 40 to 70 age group. 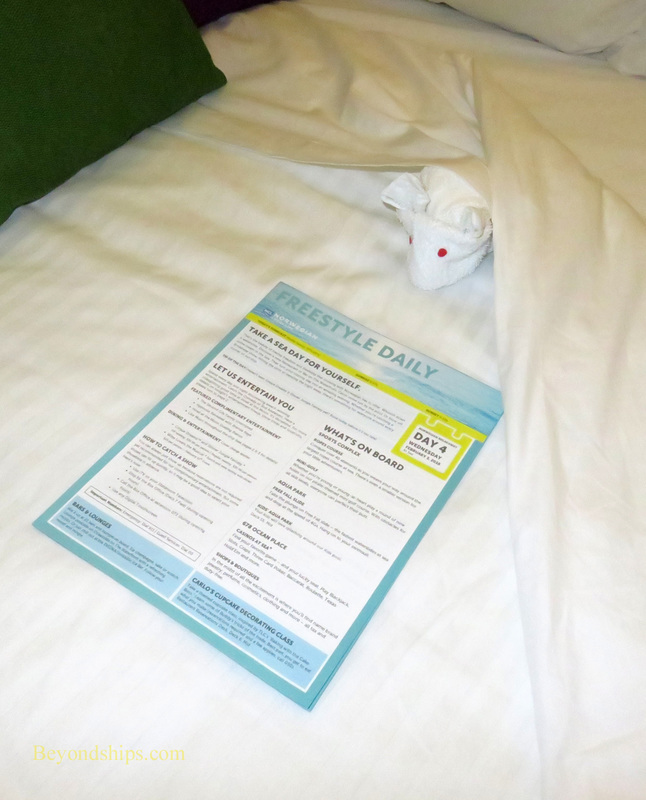 This cruise marked the introduction of a new set of menus in Breakaway's various restaurants. Based upon the menus used on Norwegian Escape, they have more variety and the dishes are made with higher quality ingredients. I was quite impressed by this change. Each dish that I had in the main dining rooms was enjoyable. On previous voyages on Breakaway, I came to avoid having breakfast in Taste and Savor, the two dining rooms on Deck 6. The offerings were limited and the food quality only tolerable. Now, I had several choices of juice including grapefruit juice, fresh fruit, yogurt, muesli, French Toast, various types of waffles, omelets and other types of eggs. Also, the clearly artificial maple syrup that used to ruin the French Toast had been banished. Of the three main dining rooms, I prefer the Manhattan Room for dinner. It has a more sophisticated atmosphere and has live music. Here, guests can select from a list of dishes that changes each night or from a number of classic dishes that remain the same throughout the cruise. Once again the quality was very good. It even included a curry that was spicy - - a rarity on ships these days. It used to be that if you wanted a premium burger, you had to go to the excellent Uptown Grill. Now, while you still have more choices at the Uptown Grill, you can get a very good burger at O'Sheehan's Neighborhood Bar and Grill. There are three varieties, each of which is a dramatic improvement over the burgers that O'Sheehan's used to serve. Also, if you are looking for something more healthy, the Caesar salad comes with a choice of chicken or a salmon filet. It can serve either as a starter or a light meal in itself. Service in all the restaurants was as friendly as in the past. However, during peak dining hours, there were sometimes delays in bringing the dishes to the table. Perhaps this could have been a result of the staff having to deal with a still unfamiliar and more complicated menu. There were also changes in the menus of the specialty restaurants. The most dramatic change is that now only Moderno and Teppanyaki have fixed cover charges. All of the other specialty restaurants now have ala carte pricing. For many guests, this change in the pricing was irrelevant because they had purchased one of the dining packages. I purchased one that covered five meals in any of the specialty restaurants except Ocean Blue for $116. (The Chef's Table experience was also not included). It soon became very apparent that this was a bargain. At the end of each meal in the ala carte restaurants, the server gives you an itemized statement of what you ate. The bottom line is zero but looking at the line items, you can see how much you would have been charged if you had bought the meal ala carte. I estimate that my first two meals in the specialty restaurants covered the price of the dining package and thus the three other meals were effectively free. Since Breakaway's specialty restaurants have always been very good, the impact of the new menus was less pronounced. I continue to like Breakaway's filet mignon, which appears in various forms on the menus of Cagney's, Le Bistro and La Cucina. Surprisingly, the best of these was not at the steakhouse but at Le Bistro. I did miss the pizza that used to be on the La Cucina menu. Cagney's, Moderno and La Cucina have outdoor tables as well as the main indoor sections. Dining outdoors on a warm Caribbean night is a great experience. The two main production shows on Breakaway continue to be versions of the Broadway shows Rock of Ages and Burn the Floor. There is also a dinner theater featuring the acrobatics of Cirque Dreams. These shows have been the main shows on Breakaway since she entered service and will continue to be such for the next few years. Because of the investment a cruise line must make to bring aboard high quality shows, the shows must run for several years. The industry average is about five years. This is not an issue for guests who have never been on Breakaway before or who only saw some of the shows on their previous cruise on Breakaway. However, inasmuch as Breakaway is based in the same port all the time, there already is a sizable minority of guests who have been on the ship multiple times. Such guests have to look to Breakaway's other entertainment. Breakaway has a strong entertainment line-up. The ship carries a comedy troupe from Second City, the Chicago-based organization which has given us an unparallelled roaster of top comics over the last half century. Because so much of their shows is based upon spontaneous improvisation, their shows are never the same. Second City shares the Headliners lounge with Howl at the Moon. These dueling piano players take the old concept of a piano lounge to a new high energy level. Because their shows depend upon interaction with the audience, they are never repetitious. Taking over for Slam Allen in the Fat Cats lounge was Charlie Love and the Silky Smooth Band. This band is somewhat more geared to Soul and Motown than Mr. Allen. However, on the last evening of the cruise, they demonstrated in a very impressive performance that they are equally at home with the blues. In addition to Breakaway's own entertainers, several visiting performers appeared during the cruise including comedians, singers and magicians. Of these, I enjoyed the wry comedy and traditional Irish music of Harry O'Donoghue the most. Towards the end of the cruise, a cast came aboard to perform the Four Seasons tribute show “Oh What A Night.” Considering the number of hits the Four Seasons had, the show has a lot of good material to work with. However, listening to this performance I found myself thinking how important Frankie Valli's unique voice was to the Four Season's sound. For intellectual stimulation, Breakaway had hypnotist Brenda Kaye. In addition to performing entertaining shows, she also gave talks on various topics such as using hypnosis for weight loss and on self-hypnosis. Then there seemed to be an unending array of game shows, dance parties, quizzes and contests led by Cruise Director Daniel (Dan Dan) Cuasito and his staff. Where do they get so much energy? In short, there was more than enough to do. On her way down the East Coast, Breakaway had to depart from her planned course in order to rendezvous with a Coast Guard helicopter that would evacuate a passenger who needed shoreside medical care. (See article). Because Breakaway had to go so far off course, the ship had to cancel her call at San Juan, Puerto Rico. Of the ports on the itinerary, this was the best one to miss because Breakaway had been scheduled to dock in San Juan late in the afternoon and thus the guests would not have had much time in port. The weather in the Caribbean was good with only the occasional passing tropical shower. Returning to New York was more eventful. Two low pressure systems lay between the ship and her destination. Captain Hakan Svedung skirted around the first low pressure system. While we were still in clam seas, he loaded extra ballast water into the ship's tanks. This would cause the ship to sit lower in the water and be more stable in the anticipated bad weather. In addition, he brought Breakaway up to near full speed. This gave him the flexibility to slow down and thus make the ride more comfortable for the passengers in the bad weather. Even so, the Captain announced that Breakaway would be delayed in reaching home. In the event, it turned out to only be a delay of about three hours. ​We went through the second storm, which had waves of over 20 feet and 60 mile an hour winds. As we came closer to New York, you could see some snow on the outdoor promenade. However, while the views of the sea out of the windows were awe inspiring, Breakaway handled it well with only slight movement. 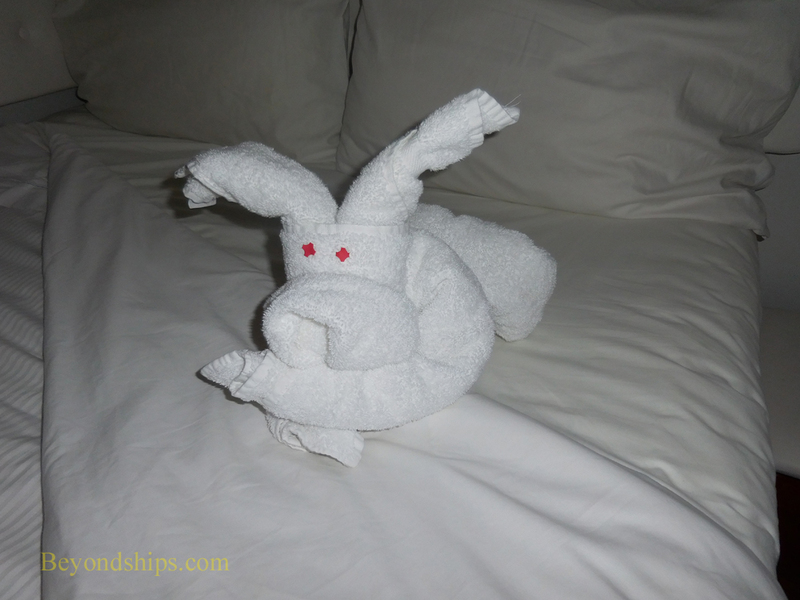 The vast majority of passengers were out and about enjoying the ship.